I am getting garbage at the end of the source, when I go back and forth from source to displayed text. I can get this to happen with the demo here. you don't have to do anything.. just switch back and forth from text to source and back again. so.. what is this? I'm having to delete it all the time when I copy in html. after the 2nd switch to source... YIKES!!! This is an image inserted into HTML. It must be something your browser is doing. I attached the image, if it helps to identify the source. thanks, A.M. remove the display:none... duhhh. should have seen that. tried it with IE, and it didn't happen. the problem add-on is Wired Marker. I don't know if it is just Firefox 3.0, or if this extension causes problems in other versions of Firefox. 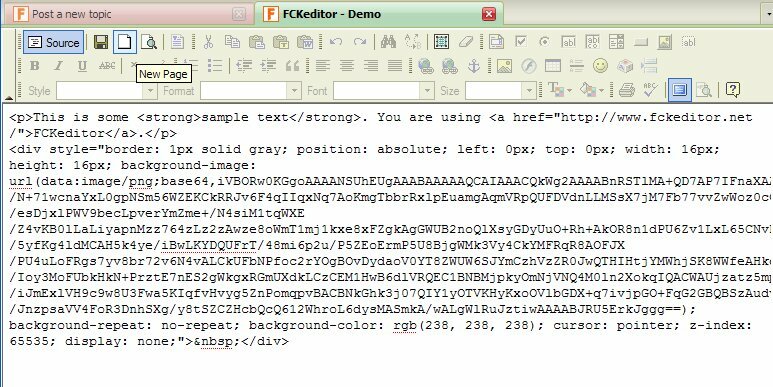 <?xml encoding="utf-8">This also happens in the Mozilla rich text editor, when you have the Wired-Marker add-on. I bet this is going to happen in other editors, too, that switch between source and display text. I am a member of the Wired-Marker development team. Sorry for the inconvenience recent bugs on Wired-Marker may have caused you. We do thank you for bringing them to our attention and we take action to make corrections as quickly as possible. The problem mentioned here occurs when using Wired-Marker on Firefox 3. We have just launched a newer version of Wired-Marker (2.0.08071001), and the problem was fixed. So please try the newer version and let us know if you face any further issues. The latest version can be downloaded from Firefox Add-ons if you have an account, as it is still in the sandbox. If you don’t have a Firefox Add-ons account, you can download from Wired-Marker website. This problem also occurs when using HYPER-ANCHOR on Firefox3. So when using HYPER-ANCHOR, please check you are using the latest version of HYPER-ANCHOR (0.1.08071000). The latest version of HYPER-ANCHOR can be downloaded from Firefox Add-ons if you have an account. If you don’t have a Firefox add-ons account, you can download from HYPER-ANCHOR website. thank you so much for looking into this and posting about the new release of the add-ons which fix this problem. I appreciate it!